The Premier Alante 250, at twenty-five feet, five inches length overall, is the largest of Premier’s six model Fish & Cruise series starting at nineteen feet, five inches. 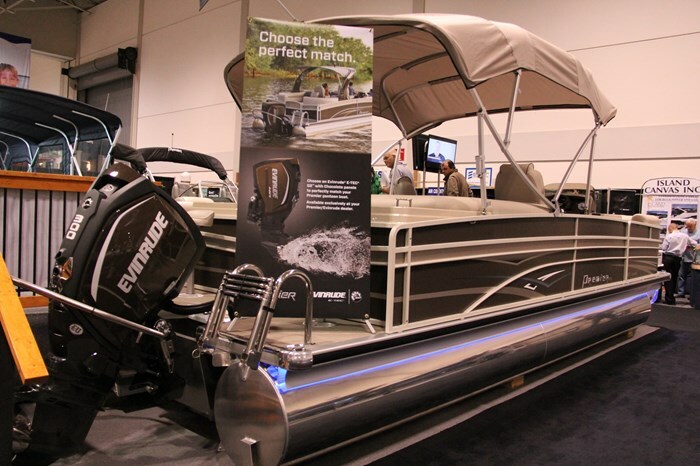 For 2015, Premier Marine of Wyoming, Minnesota, offers a total of twenty-two models of pontoon boats in three series ranging from sixteen and a half feet to thirty-one and a half feet. This largest model, on an unusually wide (for a pontoon boat) ten foot, two inch beam, is available with Premier’s Upper Dek™, in essence, a second storey. 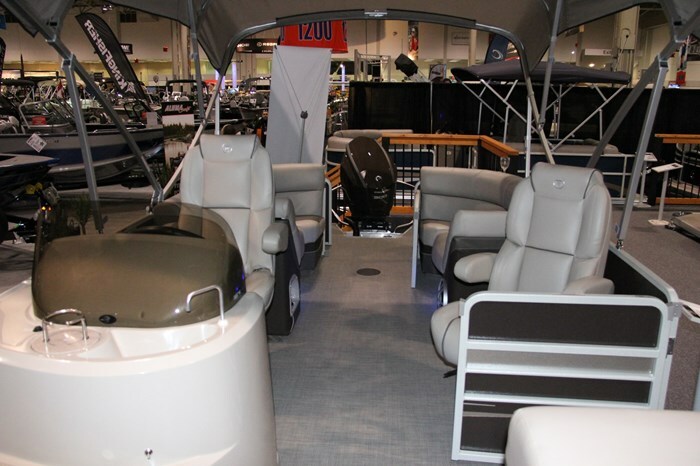 Premier offers a vast array of unusual, yet functional floorplan layouts throughout its model offerings plus some unique optional features such as that Upper Dek™, plus bars with barstools, even galleys, and even dual console arrangements with dual half-windshields. The Fish & Cruise series, of which this Alante 250 and its smaller sister, Alante 230 are a part, offer specific standard features to effectively cater to both fishing and cruising enthusiasts. 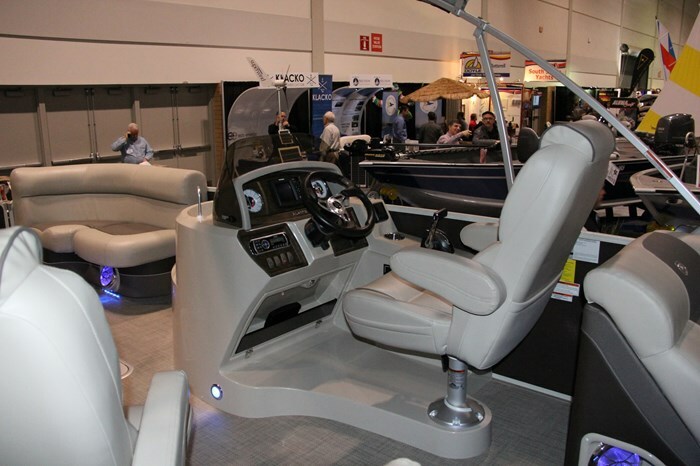 The basic layout of both the Alante 250 and 230 are identical with the same furniture and couches forward of the same pair of Executive helm and passenger chairs and the same SpinCaster helm on both models. The size difference on the two models is accounted for in the length of the facing stern lounges. Even the aft deck is identical on both models as is the list of standard and optional features. Both models are also available in a “DL” floorplan which replaces the portside bow lounge with a pair of upholstered swivel chairs with armrests. 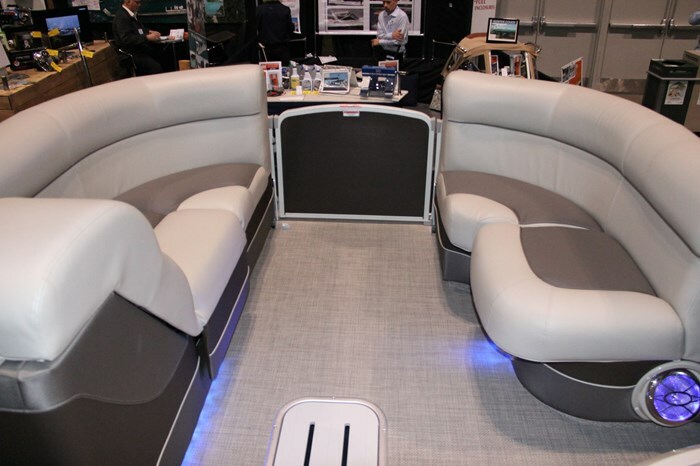 On the standard layout, this bow portside three-seater couch with sloping backrest to accommodate comfortable lounging comes standard with a pop-up Mirage changing room built into it. Opposite on the starboard side is a two-seater lounge. Both lounges have forward rounded corners. 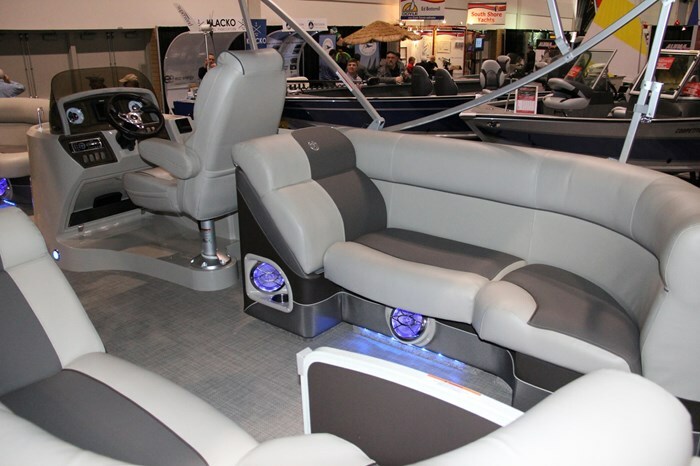 All Premier furniture features 100% wood-free Rotocast framework with integrated drainage system plus wood-free, waffle-board seat bottoms to channel water away from the seat cushion. Upholstery is of stain-resistant DuraSoft7 vinyl with a texture that “matches the look and feel for real leather” and utilizes Flexsteel® inner-spring technology. Premier’s very stylish fibreglass molded SpinCaster helm features a front-and-centre standard Humminbird 386ci colour GPS/fishfinder flanked by two large diameter dual-purpose Legacy gauges showing RPM, speed, fuel, and engine trim. Also standard is a dash-mounted Jensen MS2013BT Bluetooth compatible stereo with four high-performance speakers with directional mounts plus a 12-volt receptacle. Facing the standard tilting Hawk III padded rim steering wheel is Premier’s adjustable Executive helm chair with armrests mounted on the molded raised floor of the SpinCaster helm to provide better sightlines for the driver. A tinted windscreen provides some protection for the driver. Storage is provided beneath this helm and ahead of the windscreen, the one-piece molding of the helm continues forward to offer a two-level section with a sink with pressure water plus a livewell. On the portside opposite is an identical standard Executive helm chair and aft of this is a “slim table” with molded-in drinkholders and immediately aft of this, facing three-seater lounges on each side. A centre stern gate leads to the vinyl-clad aft deck dedicated to the fishing enthusiast with a standard portside fence-high compartment with a second livewell complete with bait bucket and a similar starboard side compartment with another sink plus paper towel holder. Also on this aft deck are a pair of pedestal bass seats and an illuminated boarding ladder is standard. 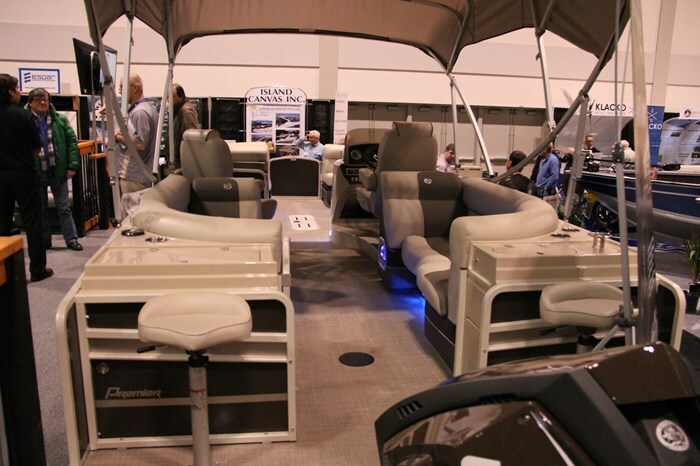 Other notable standard equipment on the Alante 250 includes a pair of .090 gauge, 25-inch diameter pontoons, LED docking and courtesy lighting, a 13’6” long Evolution bimini top with trailering kit, a dedicated trash storage container with door, playpen cover, and vertical rod holders. Maximum rated horsepower of your choice of Honda, Yamaha, Evinrude, Suzuki, or Mercury for the standard two-tube set-up is 175. You can also choose Premier’s patented 30 or 36-inch PTX™ Performance Package which increases the horsepower rating to 250 and 300 respectively plus adds a seven-foot long in-floor compartment plus a larger fuel tank as well as performance upgrades on the tubes. You will also need to choose from five base colours for the panels, six panel accent colours, six canvas colours, two base vinyl furniture colours, four furniture accent colours, three carpet choices, and/or six other flooring choices. 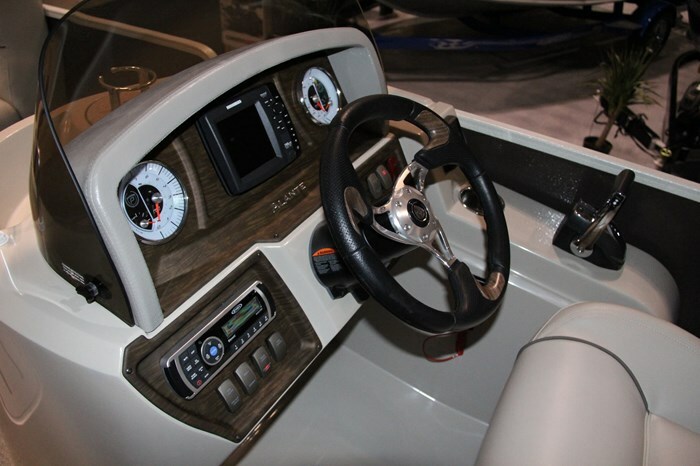 Other notable options include Premier’s in-dash Beacon Electronics System which is a customized touchscreen that gives you a complete view of your vessel’s systems so you can monitor speed, RPM’s, fuel level and engine diagnostics and complete with a full GPS plus stereo control. Also choose electronics upgrades, additional canvas, Brite Tube package, Saltwater Package, LED strip lights, among other optional equipment. 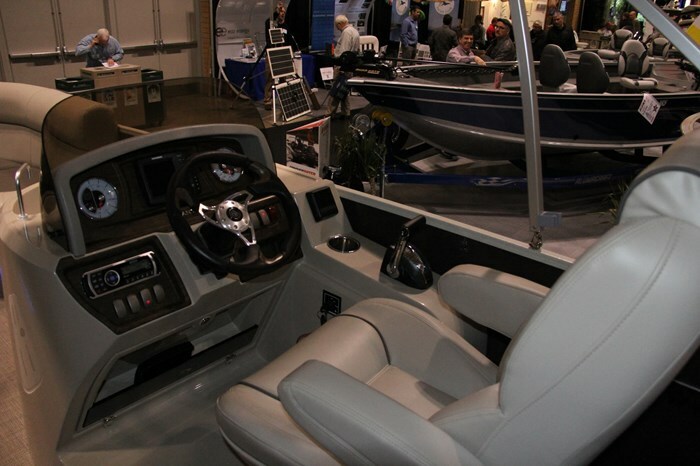 Premier’s Alante 250 is dedicated and equipped to offer you fishing and cruising in comfort.